After earning his master’s degree in education at the University of Nebraska at Kearney in 2001, Pun returned to his native village of Nangi, in the Myagdi district of Nepal, with a dream: to provide better educational opportunities for the children in the remote Himalayan foothills. He upgraded the village school and made it not only a source of education, but also the hub of community development projects. In order to generate money to run the school and create job opportunities for the villagers, he started several income-generating projects in his village and neighboring villages such as yak- and rabbit-farming, cheese- and jam- making, a campgrounds operation and many others. But because there were no telephones or modern communication system of any kind in that region, Pun had to walk for several hours from one village to the next, to communicate with people. 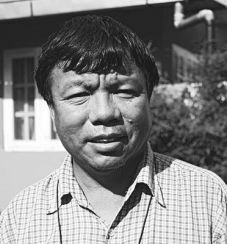 Pun founded the Nepal Wireless Networking Project in 2002 to build a local communication network using wireless technology to connect people in the Himalayan communities. His goal was to bring the Internet to the rural schools, to promote digital literacy and to improve the quality of education. However, the task of building a wireless network in the remote Himalayan region using Wi-Fi in early 2000 was arduous because Wi-Fi was an emerging technology back then. Also, the government of Nepal had banned the importation and use of wireless equipment because of the fighting between Maoist rebels and government forces there. The villages, which did not have access to electricity, had never seen computers. In spite of those challenges, Pun was able to connect 13 mountain villages by 2006 to a Wi-Fi network and the Internet. Since then, he has expanded the network and services to over 175 remote villages in 15 districts of Nepal. Today, those villages are using the Internet for e-learning, e-healthcare, local e-commerce, community discussions, money transfers and weather monitoring. In 2007, Pun received the Ramon Magsaysay Award from the Philippines for his “community leadership and innovative application of wireless technology in Nepal, bringing progress to remote mountain areas by connecting his village to the global village.” The award has been called “the Nobel Prize of Asia.” Pun also received an Honorary Doctorate of Humane Letters from the University of Nebraska, along with many national and international awards and recognitions.